Surname distribution mapping reveals that the Graham surname is associated with Scotland and bordering English Counties. Since farmers with each surname still concentrate in the area where one’s ancestor lived when he first inherited his surname, or in the area where one’s ancestors first settled, an examination of the location of Graham farmers in early census data reveals 10 distinct clusters (see attached image). Science has revealed that surnames that had a single founding ancestor are associated with a single geographical location. Hence the 10 distinct groups of Grahams may each have been founded by an unrelated ‘Adam’ (literally the first male (Adam) to take that surname) and simply share a surname, or they may be genetically related to one another and arose due to migration. Modern commercial ancestral DNA testing can answer questions regarding the origin of one’s Scottish Clan and relatedness among males that share a surname. Since surnames arose among related males living in a specific location, it means that each of the 10 Graham groups will have a ‘fingerprint’ of genetically matching surnames revealed upon Y-DNA testing (Y-DNA testing explores the male line only). This means for example that a Graham from Ayrshire will upon Y-DNA testing be a genetic match to males with surnames like McCrindle, McWhirter, Templeton and Dinning; surnames associated with Southwest Scotland. While in contrast a Graham from Ross and Cromarty will upon Y-DNA testing match males with surnames like Aird, Tolmie and Urquhart; surnames associated with the North of Scotland. Hence it is one’s genetic surname matches revealed upon YDNA testing that will reveal where your Graham ancestors once lived or rather originated within Scotland. Scottish Origenes is delighted to share 3 Graham Y-DNA reports (linked below). The Y-DNA results revealed that the three Graham test subject were unrelated to one another. The Y-DNA results also revealed that each test subject was related to one of the 10 geographically distinct Graham Clans. The Graham of Dumfriesshire DNA Report can be downloaded by clicking here. The Graham of Lanarkshire DNA Report can be downloaded by clicking here. The Graham of Argyllshire DNA Report can be downloaded by clicking here. All 3 Graham test subject’s are genetically unrelated and simply share a common surname. As more Graham males participate in YDNA testing it will reveal whether the 7 remaining identified Graham Clans are unrelated or whether some share common ancestry (and arose due to migration). Eventually every Graham that participates in Y-DNA testing will, based upon their ‘fingerprint’ of genetically matching surnames, be able to identify where precisely the Graham ancestors originated. 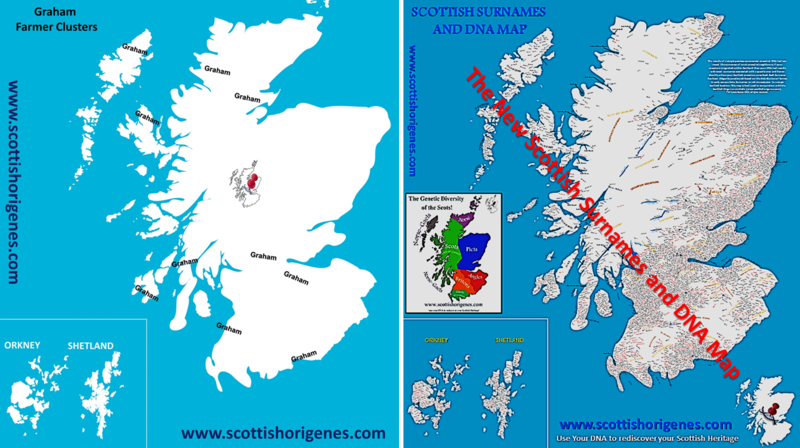 The New Scottish Surnames and DNA Map (previewed here) is designed to help one understand one’s DNA results and identify where one’s Scottish ancestors once lived. If you have taken a commercial ancestral DNA test and would like a FREE CONSULTATION then contact me by clicking here. If you would like to participate in commercial ancestral DNA testing and want to find out what test is suitable for you then contact me by clicking here. What will your DNA reveal?